Maybe I’m naive, but I have no idea how to type those two little dots over the word naive. Nor do I know what they’re called or why they’re there. Fortunately, I’m a pro at cutting and pasting. Normally, there’s just one dot over the letter i. This is called a tittle. Adding a second dot turns the tittle into an umlaut. An umlaut is a type of diacritic mark – a glyph added to a letter – that is used to change the sound value of that letter. Other examples include façade (the dangly glyph is warning us we are to pronounce the c like an s instead of a k) and fiancé (that glyph, called an acute accent, tells us it’s a instead of e). Is your head spinning yet? Mine is. And I’m a professional writer. Man alive, the English language is complicated enough with apostrophes and commas. Start throwing dots and curls and tildes and hooks into the mix, and you’re just asking for trouble. Why all the grammar talk when there are far more pressing issues in the world, like how many hours a night the Royal Baby is sleeping now? Because I recently went toe to toe with the owner of the company, waging a battle over the Oxford comma…and lost. For the record: I’m pro-Oxford, he’s against it. What is an Oxford comma, you ask? I’ll let the experts at the Oxford Dictionary (appropriately enough) tell you. We sell books, videos, and magazines. The Oxford comma is also known as the ‘serial comma’. There ya go. We writer types get very passionate over this sort of thing. Which means we writer types are nerds…umm, yeah. We writer types are nerds. There’s no two ways around that. Luckily, some women find nerds attractive. Am I right, Penny? Anyway. I’ve been writing articles for my company for eight months now, but until recently wasn’t involved in editing. And then suddenly, I was. While looking over something management had written, I added all the Oxford commas they had omitted, and returned it to my boss. Who returned it to me, with all the Oxford commas I had added omitted. Thus began a battle in which, sadly, I never had a chance of winning. I mean, it’s their company. They sign my paycheck, not vice-versa. So if they say Oxford commas are stupid, then Oxford commas are stupid. There’s hope for nerds everywhere! Only they’re wrong. Because by their logic, This book is dedicated to my parents, Ayn Rand and God is correct. Ayn Rand and God are not your parents. Say instead, This book is dedicated to my parents, Ayn Rand, and God. It’s crystal clear. I’m right, and they’re wrong. But whatever. In happier news, today is a very important day for Tara and I. Not just because we filled out our application for a marriage license (we did, and we’re only working a half-day tomorrow so we can go into Portland and get it signed), but also because August 22nd was the day when Everything Changed. Two years ago this evening, Tara “stopped by” my place on her way back home from Seattle. Our initial date 11 days earlier had fallen through because she decided to go and get gallstones. The gall of her! (As revenge, I got them myself 3 months later, when she was visiting for Thanksgiving). I’ve written before of our gradually evolving friendship that had reached new levels via phone and text in the weeks preceding her visit, but I still had no expectations other than a nice dinner out, a couple of drinks, and some small talk. All of which happened, but then back at my townhouse we were suddenly kissing, and that was completely unexpected and thoroughly amazing. I still get shivers thinking about the first time our lips met. It was (and still is, every single time) electric. So there we were, making out on the couch, things were getting passionate, yada yada, she didn’t end up leaving until the next morning. About that goodbye: I don’t think I’ve ever written about this, but when I walked her to her car, we hugged tightly. And then something happened that stopped my heart. There was a hastily added addendum – “as a friend” – but I’ll always remember the rush of adrenaline that coursed through my veins when I heard those words. No, I didn’t really believe she loved me, loved me. But it gave me a little thrill to hear. When her car pulled away, I didn’t know if I’d ever see her again. I certainly had no idea I’d be pulling up in front of her house 16 days later, or she’d be moving in with me in 8 months, or – best of all – we’d be headed to the courthouse to pick up our marriage license two years to the morning that we said goodbye. It’s poetic. All of it. And the story is still being written. The tittle and jot are biblical. I had no idea. I’m not even going to attempt to write those two words! My company also deletes the serial comma, and I always tried to put it back, losing the same battle you did. Though I think we try to take a meaured approach: sometimes the extra comma really is just stylistic (“I like red, yellow, and blue” is not significantly different in meaning from “I like red, yellow and blue” and can be deleted (I guess, if they insist) even though I personally might like it to appear. In a list like your example, where there’s a mix of titles and names, the lack of commas leads to a giggle at best and a silent wondering whether you need psychiatric help at worst. What’s more, sometimes that comma is absolutely essential. There was a case of an estate where the will was phrased along the lines of “I leave all my possessions to my children: Bob, Mary and John.” It was decided by the court that the will as phrased meant that the estate should be divided not into 3 equal parts, but that Bob should get one half, while Mary and John shared the other half. Wow. The court actually divided up the estate that way? I’m surprised – I’d just chalk it up to ignorance on the part of the mother and divide into three equal parts, but I suppose if you’re following the letter of the law, you can’t make assumptions. Yet another reason for the Oxford comma! Three Cheers for the Oxford coma! Four cheers for the marriage license! And well I walked into a comic book shop the other day and kind of felt like Penny. Holy ego boost! Guys in comic book shops get such a bad rap! lol. They really do especially when they are playing Dungeons and Dragons. I’m sure there’s some command I could look up, but I’m feeling stubborn right now. I don’t wanna! I’m happy enough to know ® and ™. That’s the extent of my non-cut ‘n paste knowledge at the moment. For a brief moment I thought your post would be slightly mundane, but not in the least. My worse bit was when you refused to leave your job in support of your punctuation marks. I know you wouldn’t have a job but, Boy, would you have been satisfied – until your money ran out! I was afraid myself the topic might veer off into the mundane, but I have a pretty good knack for making even boring topics interesting (I’ve been told). Inject a little humor and it’s all the more readable. In fact, I was once challenged to write a post about paint drying. Haven’t done so yet, but the next time we give the living room walls a new coat, you can guess what’s going to pop up on my blog! I was unemployed for 20 months between 2010-2012. Trust me, I would never look the proverbial gift horse in the mouth again. Grammar issues aside, this really is a dream job for me! No need to worry º™£ªncessantly. Grr. Maybe I should mention that I have a Mac? Ooh…gröövy! I’m göïng to go Ümlaut-crazy now! By the way, Mark. I loved the story about you and Tara. Just wanted to let you know. 2) in the newspaper biz you don’t use an Oxford comma & to this day I never use it. I much prefer using semi-colons in lists containing multiple items if needed, eg. my parents, Art & Dot; Ayn Rand and God. I know, AP Style is anti-Oxford, and that drives me up the wall. The limited “style” writing I’ve done has always been Chicago, which of course is pro-Oxford. I don’t mind a good semicolon or two, but sometimes I feel they’re out of place and extraneous when a simple Oxford comma would solve that problem. Man, you are right – you are picky! Semi-colons are so useful in lists within lists. Mark, I cannot thank you enough for explaining the ‘Oxford comma’ because I DO use it, but had no idea what it was called. Also, I’m comma crazy because I know I over use it, but am trying to get better at omitting more. Oooo…and I got all excited hearing about your wedding plans, which is coming up SOON!!!!! And I loved your story at the end! I used to be comma-happy myself, but have cut back on those over the years. 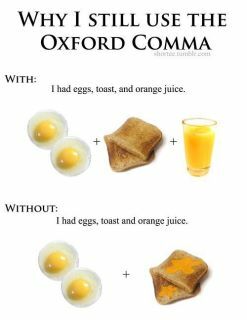 Ever since a former freelance client accused me of “comma splicing” (using a comma to join two independent clauses, i.e. “It is nearly half past five, we cannot reach town before dark” which apparently I was doing willy-nilly and never even realized it). But Oxford commas are the one place where I refuse to budge. Why should I? I know I’m right! Just a little over three weeks now until the wedding. !!!!!!!!!!! Eats Shoots and Leaves by Lynn Truss is an absolute must for you. My personal war is against the ; thing. Useless. Just start new sentence. I’ve heard of that book. It’s considered the “bible” of grammar nazis everywhere. I think you’d get a kick out of its grammar advice. Congrats on the marriage license!!! Ha – that looks interesting. I’ll be sure to check it out. Thanks for the tip! I am TOTALLY with you about the Oxford comma. I add them to everything I edit for Sara, as she doesn’t use them–just did it last evening. So, of course, you’re correct! By the way, congrats on the marriage license. How fun! Sara and I have now been married for 4 months!